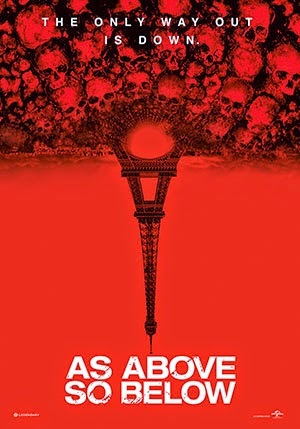 The found-footage horror movie As Above, So Below (2014) is a frightening and effective films of its sub-genre. I enjoy found-footage movies quite a bit, and lately some -- like The Taking of Deborah Logan (2014) or Exists (2014) -- have really raised the bar. As Above, So Below deserves consideration in that regard, for certain. The film concerns a trip deep beneath Paris, into the bowels of Hell itself, and the movie succeeds for two primary reasons. First, there is a strong psychological component to the action we see unfold on-screen. As Above, So Below explicitly involves the idea that we shape our own world and our own reality every single day. We can shape it into a paradise…or into Hell on Earth. Whichever path we ultimately choose, we see the world through our own eyes, and therefore our own lens or perspective. We are the same above as below. No matter where you go, there you are. Without being preachy or over-the-top about it, the film cleverly explores this leitmotif. Secondly, in keeping with its overarching theme, As Above, So Below doesn’t depend on the typical-brand of thoughtless horror that we often see in the lesser found-footage horror films. Specifically, it doesn’t rely on jump scares or mindless run-arounds/chases. On the contrary -- and much like The Shining (1980) or Event Horizon (1997) -- the film’s horrific imagery consists of the Id’s darkest dreams made manifest in the flesh. The film features much nightmare fodder, including the out-of-place appearance of a piano and rotary phone. Out-of-context, these objects don’t sound scary or like appropriate avatars for fear. In context, however, they prove terrifying. 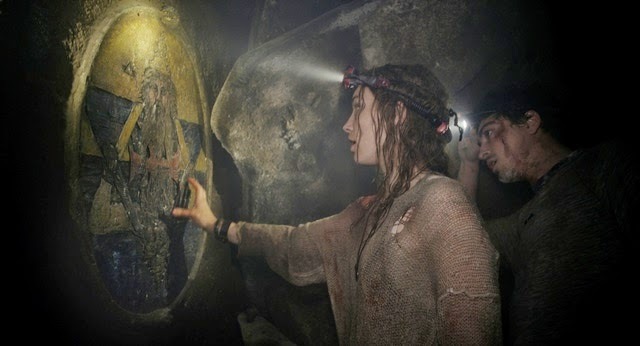 It doesn’t hurt, either, that As Above, So Below also treads head-first into the terrors of claustrophobia in the most effective manner since 2006’s The Descent. There are moments in the film that are extremely uncomfortable, and will likely scare you shitless. As Above, So Below hasn’t, apparently, earned very strong reviews, and that’s a genuine surprise to me. The film is imaginative, scary and intelligent, and therefore another redeeming entry in the ever-expanding found-footage canon. A brilliant young historian and scholar, Scarlett Marlowe (Perdita Weeks) hopes to follow in her dead father’s footsteps. In particular, she wishes to acquire the holy grail of Alchemy: the Philosopher’s Stone. This artifact is believed capable of turning base metals into gold, and more than that, grant a user the gift of immortality. Scarlett’s quest to find the Philosopher’s Stone takes her to a tomb in Iran, and then back to Paris, and the grave of legendary alchemist Nicolas Flamel. 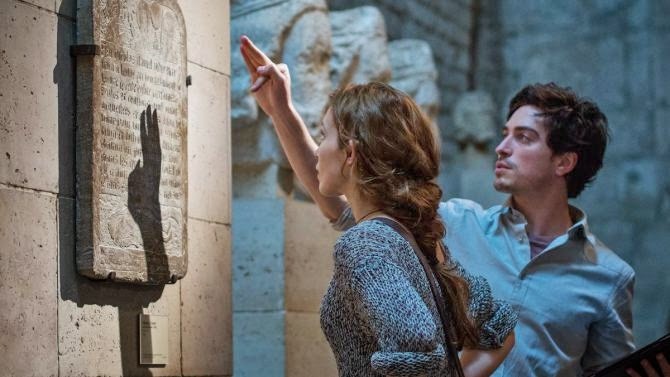 Scarlett’s friend, George (Ben Feldman) is able to translate a code found in Iran, and apply it to directions hidden on the rear side of Flamel’s tomb-stone. Together, they soon plot an expedition to go below Paris, into the ancient catacombs -- where literally millions of corpses lay buried -- to find the stone. Scarlett’s friend, Benji (Edwin Hodge) documents the quest, and guiding them through the underworld is a French local named Papillon (Francois Civil). But the journey will be treacherous. Flamel’s directions suggest that they must approach the “darkest gate,” the city of Hell itself, to find the stone. Over George’s recalcitrance, the group descends into the catacombs. The team is unable to avoid a tunnel which Papillon says is “evil,” and from there, things only get worse. As Above, So Below’s deeper meaning concern’s mankind’s on-going hunt for knowledge. We search for truths forbidden or dangerous, often at great physical risk, and the characters in this film certainly take such chances here. Why? Because knowledge is worth the sacrifice. Scarlett is following in her father's footsteps for emotional reasons, but also because she sees the opportunity to know...the truth. But uniquely, the filmmakers also understand the notion that knowledge and truth are universally received through the filter of…you. How you perceive knowledge is an individual thing, and therefore personal. The film’s heroes are confronted with manifestations of the Underworld here that have deep meaning for them, and that, accordingly, serve to terrify them. One character deals with a guilty conscience, and another a sense of grievous loss that has never departed from his psyche. These fears manifest as objects in the catacombs, like an old, dusty piano that just happens to remind a character of the one his family used to own. Or, in the dark, confined tunnels -- somewhere around the next curve -- a rotary telephone rings and rings incessantly. Demanding to be answered. Pick it up at your own risk. Some characters outlast such terrors, and come out the other side. Others don’t. That means you can conquer your demons once you understand them, and yourself. Once you understand that you are the same individual, the same psyche, no matter what terrain you happen to occupy. 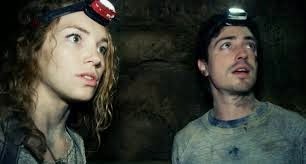 The psychological aspect of the film makes As Above, So Below resonate more deeply than some examples of this sub-genre. We all boast inner demons and ghosts, and ways with which to cope with them. 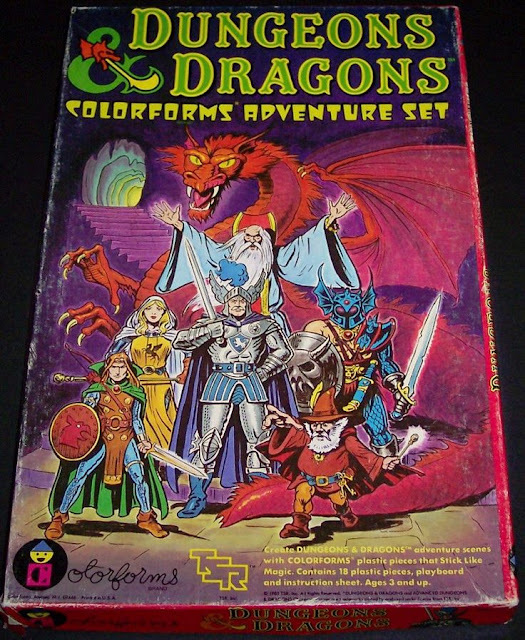 But the characters here must cope with them in the worst circumstances imaginable, in an underworld of albino priestesses, cloaked and deformed monsters, and demons that seem to literally burst from the cave walls. Yet for all the great imagination the film showcases, the most harrowing scene concerns a very earthbound terror. The cameraman, Benji (Edwin Hodge) must crawl through a tunnel (with a floor of bones) that is extremely tight. About half way in, he gets stuck. He tries everything to break loose, and yet can’t find a purchase. There’s no way backward or forward, and it's as if he is paralyzed. The moment is played out to agonizing, panic-inducing length. I admit it, this is personal to me. I have a bias. I am deeply, deeply bothered by the thought of being buried alive in a cave, trapped under tons of rock, with no route of escape. I don’t know why, precisely. I’m just wired that way. The Descent just about drove me up a wall with its finely-honed sense of claustrophobia, and As Above, So Below accomplishes the same feat. My wife and I had to practice deep breathing together to get through the scene. It’s that harrowing. I suppose I admire the film precisely because of the yin/yang it embodies. As above/so below. Director John Erick Dowdle seems to appreciate and comprehend both the “irrational” aspect of the horror scenario here -- expressing something fearful that affects you on a deep, psychological level -- and the smart, intellectual aspect of the central scenario as well. He understands what roils beneath the surface, and the surface itself. Think of it as subconscious fear versus conscious thought. The characters, but particularly Scarlett, take multiple opportunities in the film to think their way through crises. They do so using their fund of knowledge (alchemy and history), and their common sense. One terrific scene sees Scarlett and George attempting to solve the riddle of a hidden back door exit to a subterranean chamber with no obvious point of egress. The duo must select the right rock, utilizing a puzzle/directions to find it. But to move the correct rock, they must know the number of planets in the solar system, or rather the puzzle-maker's knowledge of the number of the planets during a previous historical epoch. This is one of the film's authentically brilliant moments, as the characters go back and forth, in rushed, staccato voice, piling on every bit of historical data they know before arriving at a decision. As Above, So Below really hit a sweet-spot with me. It takes intelligent, resourceful characters, and asks them to think their way in and out of Hell itself. I found their efforts fascinating, riveting, terrifying, and finally rewarding. If the found-footage format can keep generating original, focused horror films like this one (as well as ones such as Exists, or Deborah Logan), the cliches about it being "dumb" or "cheap" may have to be cast aside permanently. I actually enjoy this type of film, never really got why people started hating them, I enjoy their "in the moment" feel. Apollo 18 was a good one...recommend it. I also liked The Last Exorcism. I'll check this one out, thanks for the recommendation. I watched this film over the weekend and it seemed to be part Descent, part Indiana Jones, part Even Horizon, with a little bit of BWP thrown in respects to the strong, domineering female character that is present in both films. Less nihilistic and more thoughtful than most of this genre, good film.